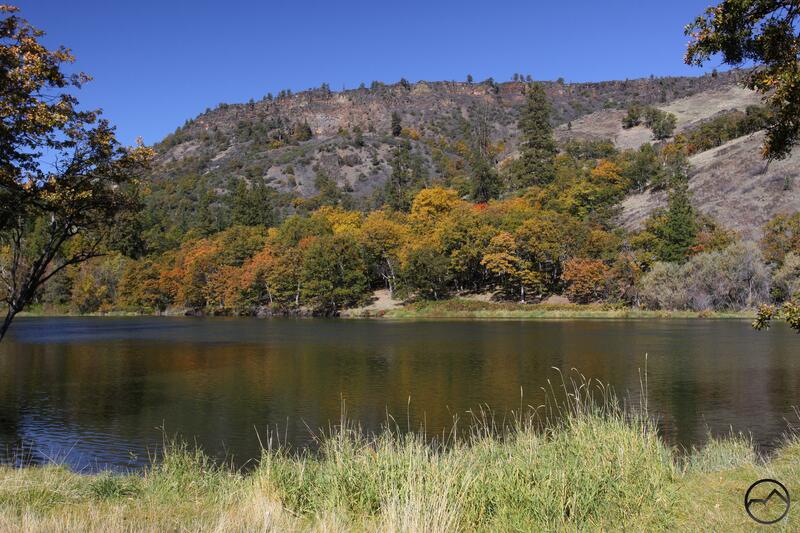 Fall color explodes as the Klamath River flows through the Upper Klamath River Canyon. 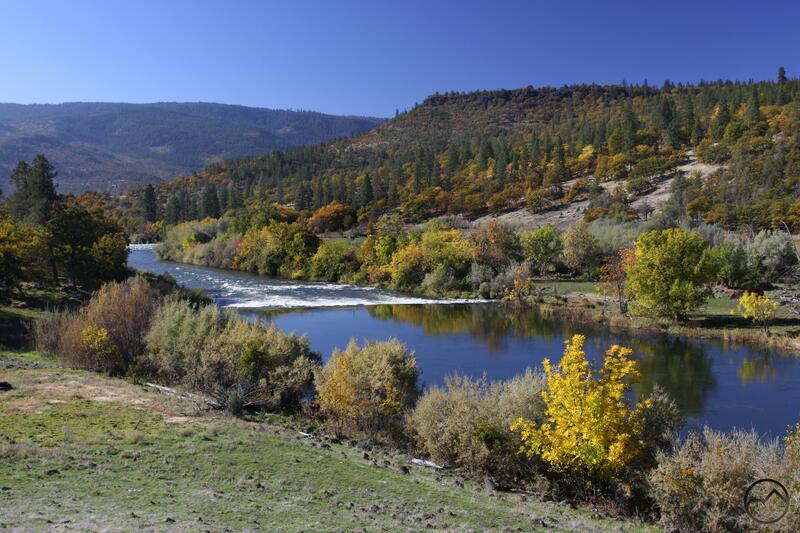 The Klamath River is one of the most important features in California’s North State region. It is easily the largest river in the area. The river begins in south central Oregon, counting the rim of Crater Lake among its various headwaters areas, and courses 263 miles through Oregon and California before reaching the sea roughly between Eureka and Crescent City. Along the way the river drains the bulk of the vast Klamath Mountains, collecting the water from other major rivers including the Shasta, Scott, Salmon and the enormous Trinity River. Though the river is large and passes through areas famous for the high and rugged mountains, it is surprising how much of the river’s travels are through arid, high desert terrain. This is particularly evident in the area between Keno, Oregon and the Horse Creek area in California. The sage and juniper covered slopes of tawny mountains pocked by dark rock outcroppings is a stark contrast to the cool, life-giving waters of the rushing river. The contrast is made even more dramatic considering the harsh desert environment is concentrated along the river corridor and just a few short miles away are the lush mountain meadows of the Marble Mountains and the Siskiyous. Of course, these are not the only mountains within easy reach of the Klamath River. Indeed, though not obvious to the casual observer, the Klamath River has an interesting relationship with the mighty Cascade Range. The Klamath is one of three rivers that begin on the east side of the Cascade Crest and then complete a transection of the mountains. The most famous and dramatic example of this is the Columbia River Gorge, where the Columbia River makes a sea level passage through the heart of the Cascades. Less dramatic but still interesting, the Klamath River and the Pit River further south also cut across the Cascades during the journey to the sea. Both rivers have beautiful, if somewhat less monumental canyons during this impressive feat. Fall colors below the Klamath Rim. The canyon through which the Klamath River achieves its traverse of the Cascade Range is one of the most remote corners of Siskiyou County and receives very little visitation, despite the great natural beauty of the area. Few people venture here for a variety of reasons, not the least of which is that it is simply a long way from anywhere and not promoted at all. Add to that the lack of trails and the large blocks of privately owned land and what few people would venture here is pared down to a relative handful of folks. Still, the canyon of the Upper Klamath (the upper section of the river is considered to be that which is up stream of the Irongate and Copco Reservoirs, which begin at the west end of the canyon) is a fascinating and beautiful formation. The river carved its passage across the Cascades at a low saddle in the range’s crest. 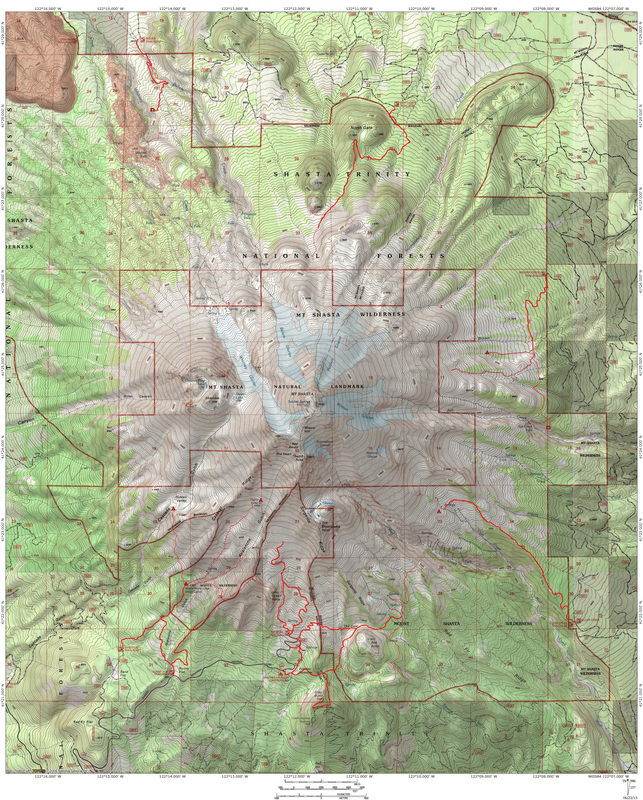 North of Willow Creek Mountain, the Cascades subside into a high, forested plateau underlayed by lava flows. The river gouged its path out of the southern end of the plateau, near where the crest rises up toward Willow Creek Mountain. This resulted in what is known as the Klamath Rim, a sharp band of cliffs that line the northern side of the Upper Klamath’s canyon. The rim’s elevation above the river varies but it generally maintains a height of about 1,000 feet. The south side of canyon is marked not by a severe edge like the north, but an undulating series of slopes rising up toward the heavily forested high country. The most interesting feature on the river’s south side is large Secret Springs Mountain, which is an ancient volcano that boasts a surprisingly large crater on its north side. Though the canyon does not have a definite rim on the south side it is still marked by steep walls broken intermittently by deep canyons of tributary creeks. The most notable is Shovel Creek, which begins in a large meadow at the divide near Little Shasta meadows, the headwaters of the Little Shasta River. As noted earlier, the river receives little visitation in part because of the lack of public land. There are no maintained trails along the river. Still, the area is ripe for exploration by those interested in seeing a beautiful place that is seldom seen. A very well maintained gravel road follows the south side of the river through the canyon, eventually passing into Oregon on its way to meeting Highway 66. The land owner along much of the river is Pacific Power and they have established 6 river access points for fishermen to use. Thankfully these offer opportunities to get down close to the river and enjoy short walks along the banks. The sixth one is the most scenic. As one heads north toward Oregon, the last little bit of the river passes through BLM land just below the border. The BLM has established a put in site for rafters with some minor amenities, including a pit toilet. This area is a fantastic and utterly underused camping spot. Solitude in this incredible canyon, along a gorgeous river is practically guaranteed. For those interested in adventure, an ascent up Secret Springs Mountain is excellent and exploring the area along the river is great. Fall is the best time to come, when the autumn colors explode along the river and the temperatures are perfect. Another great post! Thanks Bubba. Could you put some directions or a map to show the area your describing? Thanks Bruce. When I post something in the Seldom Seen category, I usually tend to keep the exact location a little vague. I guess I am trying to have it both ways, where I write about stuff people don’t often see but still not making it really easy to get there. If you are interested in a map or details on how to get there, shoot me an email and I will be glad to give you specifics. Excellent post! I liked both the information and the photos. Love the seldom seen posts! Can you email directions to the upper Klamath? Do you usually take the back road out of Dorris? Hey there! I am glad you enjoy those posts. I have a few more brewing to post soon. Unfortunately I don’t have your email. Go to the contact page, shoot me an email, and I will respond with the directions.